I’ve found it hard to talk about which anime are “good” and “bad” without any context. How can you trust my judgment of Shirobako when you don’t even know what I’ve seen before? What if I’ve only seen Berserk 2016 and Berserk 2017? Maybe Shirobako isn’t so good, then. At the same time, it’s overkill to have to look through my entire anime list — a top 20 should be good enough to tell you what I’ve seen and what I like. And here’s that top 20. Recently I’ve gotten an excuse to do nothing but watch anime every day for hours on end (I got finger tendonitis), so I’ve been going through my anime backlog. I’ve been out of the scene for basically five years now, so I haven’t watched or even heard about all but the most popular shows since 2012. 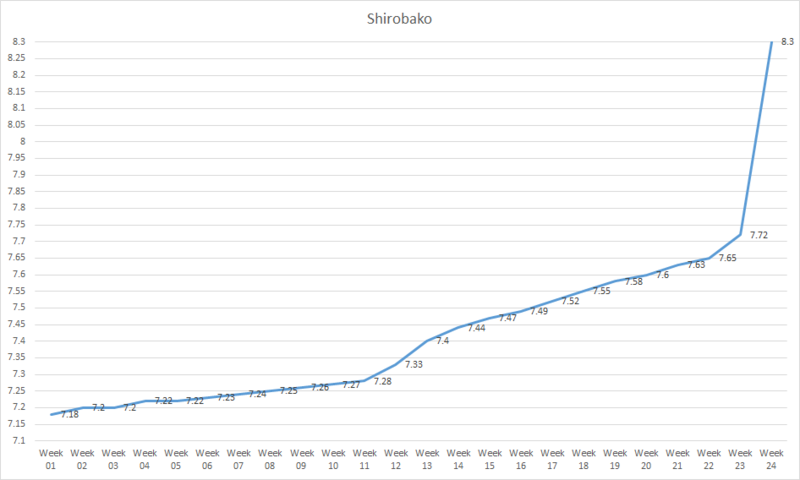 I think it’s worthwhile to give my unbiased view on Shirobako. Judging from the progression of the score on MyAnimeList (top image), people came to like it more and more as the show went on, going from a trash-tier 7.18/10 to a top-100 anime score. And from the few blog posts I read [2,3], the cultured individuals of the blogging community have held it in high regard. So this is where I come in, I guess. In my aimless browsing of memes on reddit, I ended up watching one of ProZD’s videos  where he mentions Shirobako as a top-10 anime. Although my taste in anime is completely different from ProZD’s (i.e. I wouldn’t put any of the other anime he mentions into my top 20), I started watching Shirobako almost immediately after, ran through it in four days, and slapped on a 10/10 score. Re: Is It Wrong To Make Assumptions About People From Their Tastes? So I visited an anime blog today and read half of a post, and I thought it was interesting and here’s some crap about it. 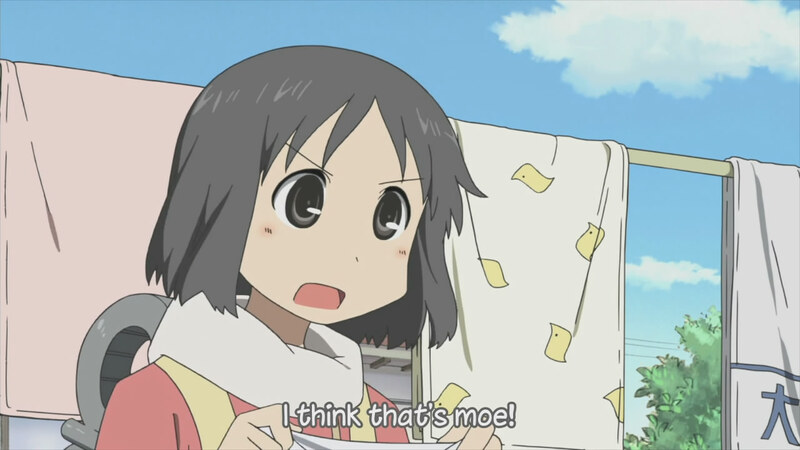 The Nichijou OVA aired way back in early 2011, a full three weeks before the greatest anime of all time graced television screens everywhere in Japan. But back in those dark times, the foolish creatures of the Earth hadn’t yet felt the embracing warmth of the great Nichijou. And thus, this OVA was panned by everyone. Panned like the rivers of California back in the 1800s. I went panning, too, and I ended up with no gold at the end of a long, harsh 20 minutes.